I am interested in saving and restoring these old clocks. If you have one of these, even one that doesn't work, please send me an e-mail! 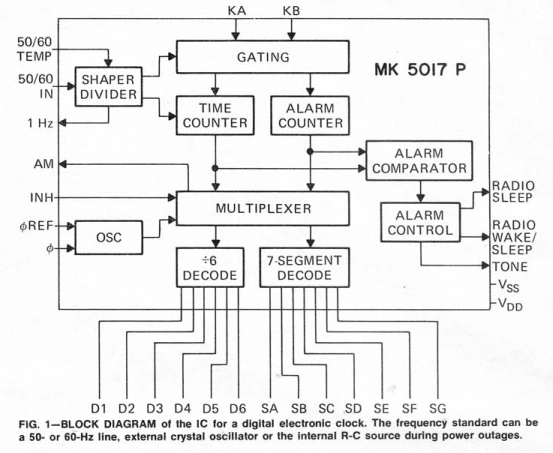 The GC-1005 was the first in a series of line-powered Panaplex display clocks from Heathkit, introduced in 1973. Time is kept from a Mostek MK5017 PAA integrated circuit. The 5017 had several variants (MK5017AA, MK5017P and MK5017A) but was always a 24-pin dual-inline package (DIP). It was Heathkit part number 443-601. The clock uses three Sperry (Beckman) SP-352 two-digit gas discharge displays. These displays decay over time - you can read more about that here. The displays were designed to fit in matching sockets, the CS-352. Although not used by the GC-1005, Dionics made chips like the DI-770 (DI-770N) and DI-297 (DI-297N) that could drive these Panaplex displays. These clocks are now four decades old, and one common problem that seems to appear is a "flicker" in the display, especially when the '1' digit is displayed. Replacing old SP-352 displays with new ones seems to fix the problem, however some additional information appeared in the Heath 1973 Technical Exchange Bulletin. Change R204 from 8.2K to 15K. After these changes check to make sure the minutes set function advances the minutes as usual, that is; 1-2-3-4-5 etc. If the minutes advance 1-3-5-7-9 then change R204 to 18k or slightly higher until the minutes advance properly. The best check for flicker is to set the clock to 1:11 and observe in a dark room. Readers have also written with their experiences. Just stumbled across your site and have some information about the flicker problem that you describe. I had the same problem with display flicker on my GC-1005. I would see flicker when a "1" or "7" was displayed. Swapping displays did not solve the problem. Changing the multiplexer timing circuit to the Mostek clock chip did the trick. For R204 I used 18k and for C201 I used 22pf. Play around with these values and I'll bet you can get the 1's/7's to stop flickering. 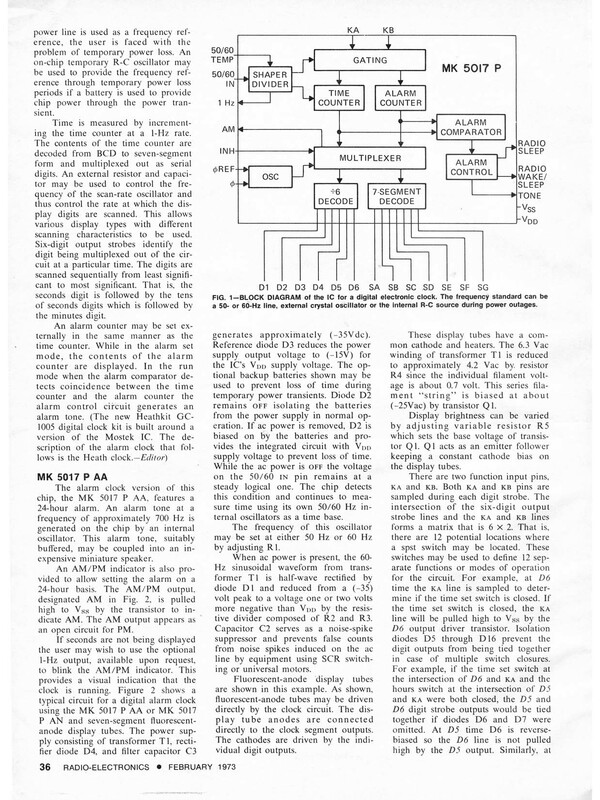 In checking your webpage on Heathkit Clocks I wanted to pass along some information that you may or may not already know. I just recently came across a GC-1092D with a display flickering problem. 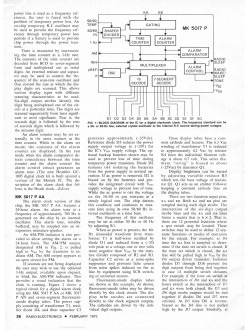 I also came across a Heathkit Service bulletin regarding display timing and the RC combination of 18K + 30pF to the MK5017 clock chip. Changing C208 in my GC-1092D from a 50 pF to a 30pF mica cap resolves the flickering problem. Other display problems include partial illumination, like the minutes and tens-of-minutes seen here. This particular clock may have a bad MK5017, since it occasionally "goes crazy" and displays minutes and seconds that are out of order (non-sequential). Occasionally this results in seconds that are greater than 59. Interestingly, the clock eventually recovers and displays the correct time. Click here to see an advertisement for this an similar clocks from the 1975 Heathkit catalog. There were two versions of this "deluxe" design. The GC-1092A model was essentially the GC-1005 with several additions. The GC-1092D model replaced the alarm capabilities with a calendar function. The unit had a top-mounted snooze button, an internal battery backup that kept time when AC power was unavailable, and an automatic light sensor that automatically dimmed the display in dark rooms. I have one of these clocks that exhibits a sequential flicker across all six digits. My guess is that the display multiplexing function from the MK5017 chip isn't quite fast enough, allowing the digits to fade between refreshes. This was sold as the "budget" model and was essentially a GC-1005. It had a beeping alarm and a seven-minute snooze alarm. It could be wired for 12- or 24-hour operation. Unlike the GC-1005, he GC-1094 applies 180 volts to the keep-alive cathode on each display, which reduces the likelihood of flickering. Click here to see an advertisement for the GC-1094 from the 1977 Heathkit catalog. The ID-1490 is a combination clock/thermometer that also uses the SP-352 orange Panaplex displays. 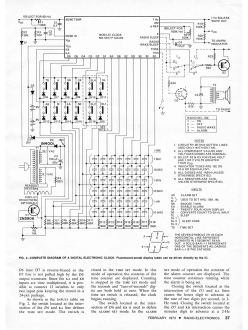 Click here for a scan of the ID-1490 from the 1977 Heathkit catalog. According to the hands on our old wall clock, it was a "quarter to nine" when we arrived at the office to begin the workday. That is the way most of us "read" time - after interpreting what is meant by the various positions of the hands on the dial face, we put the number of minutes to or after the hour first and follow with the hour, forgetting the seconds altogether. But with the new breed of numeric-readout digital electronic clocks on the market, one is forced to tell time in the proper manner. So, a glance at our Heathkit Model GC-1005 digital clock told us that our actual arrival time was a more precise 8:45:36 a.m. Telling time by the digital method is actually no more difficult than it was to tell time "by the hands." Once one gets over the initial awkwardness of having the time displayed by hours, minutes, and seconds in that order, telling the time is easy. It is faster too, because you do not have to interpret what the numbers mean. Heath's GC-1005 digital clock can be used in any room of a home or office. 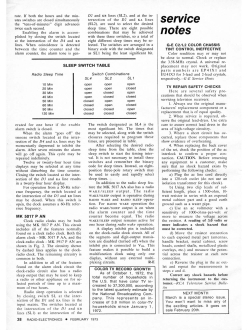 For those areas where reading time at a distance is the norm, the readouts provided are gas-discharge 7-segment Sperry Rand SP-352 units whose extra-large numerals are clearly legible at distances of 25 ft or more. A unique alarm feature makes the clock ideal for bedroom use. When assembled, the clock is fully enclosed inside a plastic case with a simulated walnut top and black end panels. The front panel contains a full-width readout filter behind which are an a.m./p.m. indicator and six numeric readouts arranged in pairs for hours, minutes, and seconds. The case measures 7" × 5" × 2-1/2" in overall dimensions and switghs a mere 3 lb. The retail price of the kit from the factory in Benton Harbor, Michigan, is only $54.95, making it perhaps the least expensive sophisticated digital electronic clock around. Technical Details. 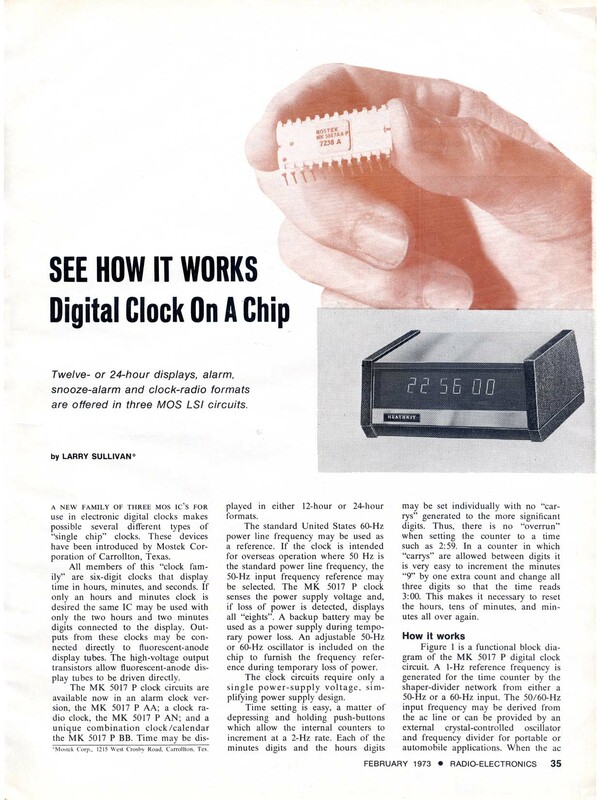 All of the digital logic functions of the clock are performed inside one of the most complex and sophisticated MOS/LSI clock chips currently available. This single 24-pin IC can be externally pre-programmed to provide either a 12- or a 24-hour time format and to permit the clock to utilize either a 50- or 60-Hz line power frequencies, depending upon whether or not certain jumpers are installed on a PC board. Aside from the usual counting and decoding functions performed by all clocks, the LSI chip also has a built-in strobe, or multiplexing, circuit for the display and a programmable alarm circuit. The alarm circuit is designed to operate on a 24-hour duty cycle (two 12-hour cycles in the event that the board is wired for a 12-hour time format), sounding only once in a given 24-hour period. 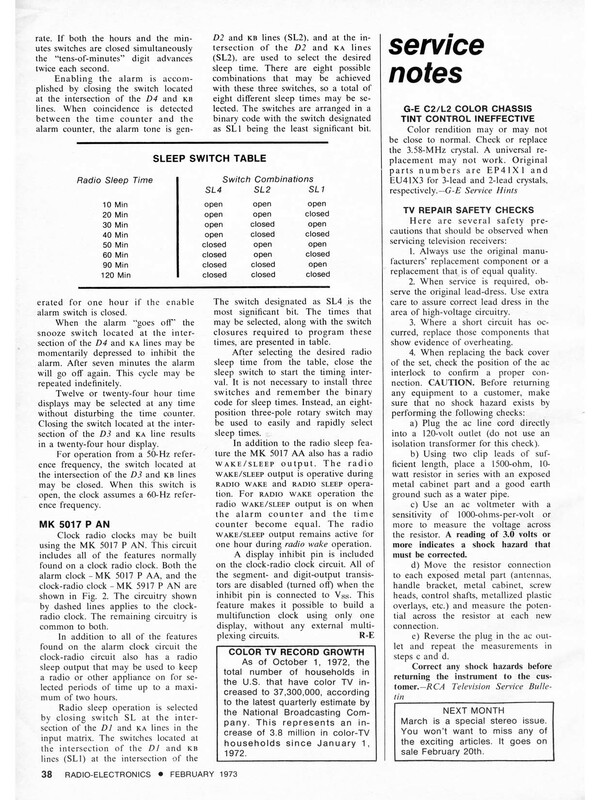 Unique to this alarm circuit is a "slumber" feature that permits the user to operate a spring-loaded slide switch to disable the alarm's gentle "beep" for 7 minutes, after which the alarm again sounds. The slumber switch can be operated as often as desired for up to one hour after the alarm initially sounds. 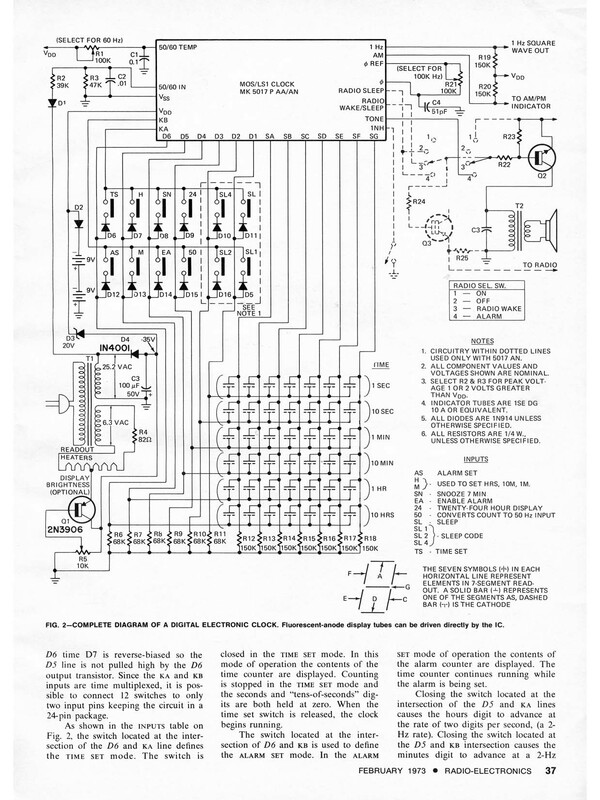 The use of a single LSI chip to perform all of the digital logic functions in the clock minimizes the number of discrete components needed to 21 transistors, 12 diodes, a handful of coupling and filtering capacitors, and about six dozen biasing and dropping resistors. Seven of the transistors are used to strobe the segments of all readouts simultaneously. Twelve others strobe the readout stages and provide high-voltage isolation for the LSI chip. Another transistor is used to drive the alarm speaker, and a final one is used in the alarm-set circuit. Six slide switches are provided for controlling all alarm and time setting functions. On the rear panel are the ALARM ON/OFF and SNOOZE ALARM switches where they are easy to get at. The less used TIME-HOLD, ALARM-SET, MINUTES SET-AHEAD, and HOURS SET_AHEAD switches are all located on the bottom of the cabinet. General Comments. Our Heathkit Model GC-1005 digital electronic clock arrived in kit form. Having in the past assembled clock kits built around a multitude of IC's and circuit boards, we anticipated a long, tedious time of kit building. However, we were pleasantly surprised to find that this was one of the easier kits in our experience. After flipping through the assembly/operating manual supplied with the kit and noting how few parts were to be mounted onto just two printed circuit boards (one for the readout assembly, the other for the logic and power supply), we were eager to get started. So, in about 4-1/2 hours, we had our clock ready for the acid test. Assembling the kit posed no particular problems except that the MOS/LSI chip required special handling to avoid damaging it through static electricity. When we first plugged the clock's line cord into the a-c outlet, the display indicated all 8's, the normal condition for a properly operating clock of this type. (All 8's also show up when power has been interrupted to the clock for more than a few seconds to tell the user to reset the time.) Once we knew that the clock had no problems, we quickly set it to the proper time with the aid of the TIME-HOLD, MINUTES SET-AHEAD, and HOURS SET-AHEAD switches. We also set the alarm with the aid of the ALARM-SET switch. Everything worked without a hitch.